You know how people are with a newborn! It’s all felicitations and congratulations. In this story, though, there is a pop. Mary and Joseph are stellar Jewish parents. They take their firstborn to the temple forty days after his birth for the purification offering (Luke 2:22-35). This is both custom and law. And it is all good. Passersby hold curious expressions. Many smile at this new mom, dad, and their little bambino. The cooing baby is the centerpiece, after all. It’s a beautiful celebration. And who doesn’t love a party? A righteous and devout man named Simeon appears. Mary naturally hands Jesus over to this aged sage who, scripture says, has the Holy Spirit upon him. Hearts swell. This is the Big Deal. The moment couldn’t get more precious. Ouch! Who wants to hear this when they’re in the presence of their newborn on the Big Day? Maybe this isn’t a pop as much as it is a blessing, an emotional roadmap of what is to come. Starting with the visit from the Angel Gabriel announcing her forthcoming pregnancy, Mary has already had quite the journey with Jesus. First, she had to explain to those closest to her how she became pregnant, and THAT raised a few eyebrows. Next, Joseph could have nixed their engagement and left her literally destitute. Now this? A sword piercing her heart? Adding one plus one, Mary does the math. God has found favor with her. YES! Now she learns a sword will pierce her heart. Also yes. Peter, Andrew, James, John, Paul and Silas all came to understand what Mary understood after Simeon had shared his prophecy because, like Mary, these souls would also be pierced by that “sword.” Each would fall before God. Broken in shame and humbled in repentance, these followers understood what we can understand: it is no longer about us but how God lives through us. I don’t think Mary’s jaw dropped. She may have been surprised—maybe even stunned in the moment—but as our good and gentle God was present to her, our good and gentle God is present to us. In time, she owned what we can own. There is no selfishness to Christianity. It is what Simeon knows full well. It is all service. This blog first appeared in The Independent on January 9, 2019. I’ve posted dozens and dozens of photos and art pieces with my posts. This is my first comment on anything I’ve shared. 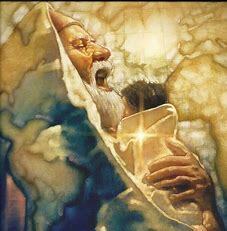 This picture of Simeon and baby Jesus speaks not a thousand words to me, but a hundred thousand words. In this art, I see a religious man’s greatest moment, the culmination of all of his years of faithful service. To hold the One who would forever change the world? Our artist here captures this unearthly sensation masterfully.